In Clocks > Mantel Clocks > Show & Tell. 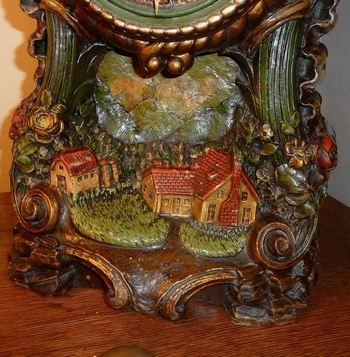 This Lux Harvest-Time mantle clock features an 8-day spring driven movement, ca. 1929. Certainly the largest mantle clock produced by the Lux Clock Mfg. Co. 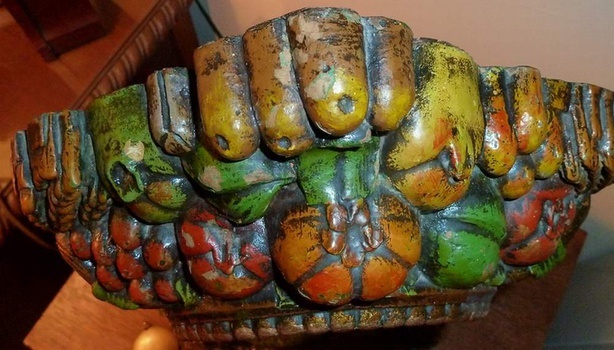 The brightly painted and delightfully formed case is made of "syroco wood." The pendulum and hands are not original to the case. Having seen a number of this particular model over the years, I will say that this one has retained the majority of it's original paint. Various small areas of chippy paint only adds character. Severe loss of paint or 'refurbishing the paint' renders the clock almost worthless. I can't count the number of Lux clocks that I bought and sold during what I call the Lux heyday roughly 10 years or so ago. The prices were crazy high for even some of the run of the mill pendulettes in very good condition. Some of the more prized or rarer pendulettes brought in $200++ up to $700+ If you had the original box... watch those bids come flying in even faster! 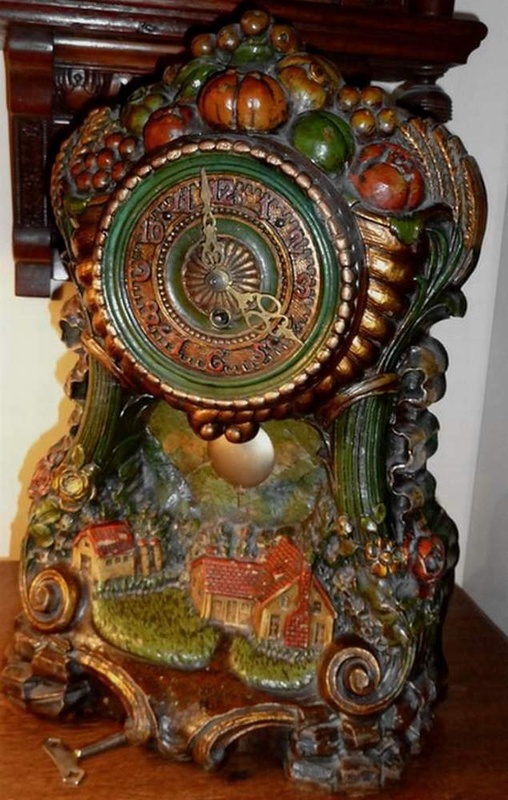 It was Lux clock fever back then. It'll come back again, but when is anybody's guess. 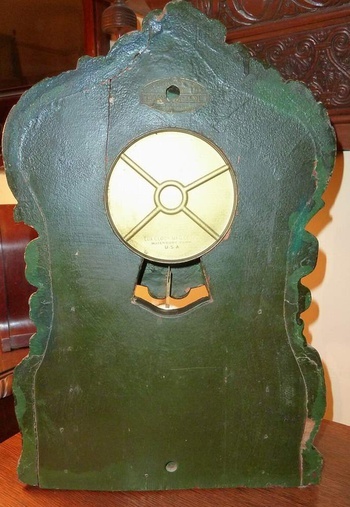 This clock has a height of 16" and width of 11 1/4" and weighs in at 12 pounds! It's a fun time only clock with a very brisk 'tick-tock'. Very nice addition to any collection I would imagine. Never seen one before. Thanks, as always, for sharing with us. Hi Kerry and Bruce... thanks guys for the love! Kerry, I hope you don't have a shmoo clock... that's one Lux clock I couldn't be bothered with. Preferred all the fun syroco clocks. Bruce, this model 10-12 years ago, one could expect to garner $350-$450 in orig and very good to excellent condition because this model rarely showed up for auction. Today? Not anywhere near that amount or no sale at all! Appreciate the love PhilDavid! I agree with your comment and I bet is was a very pretty Harvest style frame. Love the "loves" from Belltown, geo26e, Manikin, vanskyock24, inky, fortapache, walksoftly, and aghcollect. Always fun to share this crazy clock with ya'll.